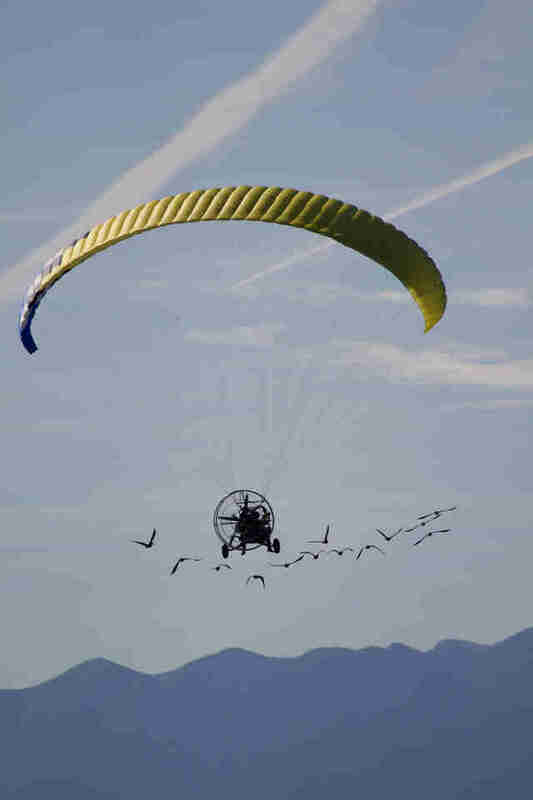 With the help of their human foster parents leading the way in an ultralight aircraft, a group of 14 young, critically endangered birds have successfully learned how to fly a new migration route from where they were bred in Austria, over the Alps to their winter feeding grounds in Italy. 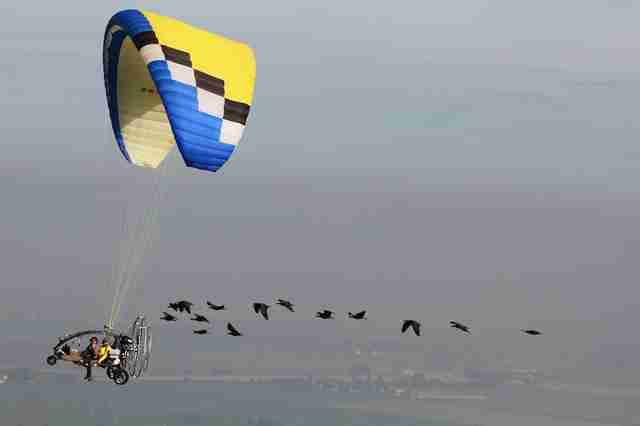 For a little over a decade, Johannes Fritz and his team from Waldrapp have been undertaking a monumental project to reintroduce Northern Bald Ibises to their native habitat in Central Europe. The rare birds had been driven to extinction on the continent some 400 years ago, though today, thanks to efforts to revive them, they're slowly making their way back. The process of instilling the once-extinct species with the lost knowledge of how to migrate, normally handed down from one generation to the next, has been a work of dedication. The project centers on ibises hatched at a breeding center in Salzburg, Austria, who are then imprinted to human foster parents that hand raise them into adulthood. Once old enough, the young birds are shown how to fly the 200 or so miles to wintering grounds in Tuscany - by their "parents" who fly alongside them in slow-moving aircrafts. Since the project's study phase began in 2003, a small number of ibises have shown promise in regaining a foothold in Central Europe, though it hasn't always been smooth sailing. 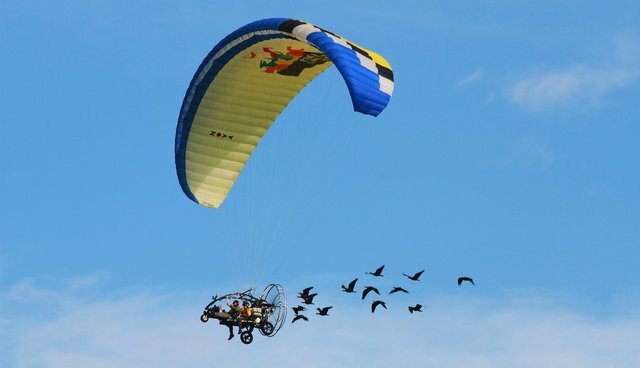 The team had previously taught the birds to follow a course around the Alps, though doing so has put them in greater contact with humans, leading to some of the birds being targeted by poachers. 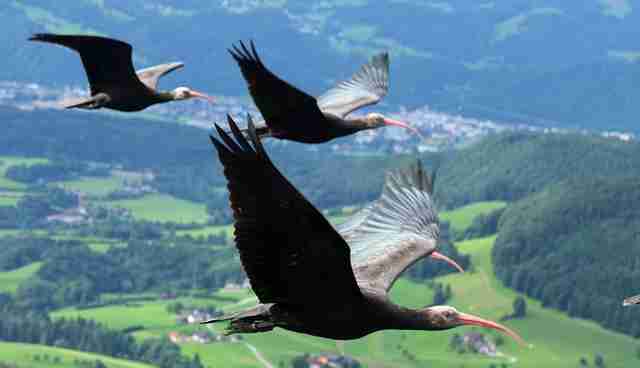 But this year, Fritz and the team have charted a new course, one with fewer hazards, which takes the young ibises directly over the Alps. This month, 14 birds hatched at the breeding center followed their foster parents in flight from Austria to Italy. "The best thing about the whole project this year was it only took us eleven days to make the trip, which means they moved from the protected area in central Europe much quicker to Italy, which meant less danger at least from hunters on the way," Fritz told the Austrian Times, adding that the windy passage over the mountain still made for a tough flight. "That the birds under these difficult conditions followed the aircraft at all is certainly down to the extremely close relationship with their two foster parents." The 14 birds joined other ibises there who have grown independent after being shown the way before them. And, with any luck, from that group, future generations of these once-extinct birds will learn the way too - thanks to a legacy passed down to them from the unlikeliest of "parents." Fritz says the goal is to raise and teach more Northern Bald ibises in hopes they reach a viable population of around 120 birds by 2019.